Here is the list of the hotels near Marpaps. Book your hotel near Marpaps today, Monday 13 May for the best price, reservation and cancellation free of charge thanks to our partner Booking.com, leader in on-line hotels reservation. Below here is the list the 50 closest hotels of Marpaps, sortable according your criteria. You will find the position of these accommodations on the Marpaps hotels map. Bed and Breakfast Castaignos-Souslens Preferred hotel ! Souslens is located in Castaignos-Souslens. Free WiFi is provided. A continental breakfast is available every morning at the bed and breakfast. At souslens you will find a restaurant serving French cuisine. A dairy-free option can also be requested. The accommodation offers a barbecue. Guests at this property can enjoy cycling nearby, or make the most of the garden. Dax is 42 km from souslens, while Mont-de-Marsan is 40 km away. Pau Pyrénées Airport is 42 km from the property. Ferienhaus mit Pool Nassiet 100S is located in Nassiet. Guests have access to free WiFi. The holiday home is fitted with 5 bedrooms and a fully fitted kitchen with a dishwasher. Dax is 37 km from the holiday home. The nearest airport is Pau Pyrénées Airport, 46 km from the property. Guest accommodation Amou Preferred hotel ! Situated in Amou, Luxury Little Cottage offers accommodation with a private pool. Guests staying at this villa have access to free WiFi and a fully equipped kitchen. With direct access to a terrace, this villa comes with 3 separate bedrooms. A flat-screen TV with cable channels is offered. The villa offers an outdoor pool. Dax is 32 km from Luxury Little Cottage. The nearest airport is Pau Pyrénées Airport, 45 km from the accommodation. Au Feu De Bois is located between Dax and Pau, in the Landes region of southern France. The hotel has an outdoor swimming pool and offers free private parking and free Wi-Fi. Guest rooms at Au Feu de Bois have a flat screen TV and en suite bathroom with a shower and hairdryer. A breakfast is served daily and guests can enjoy a traditional French meal in the hotel’s restaurant. The hotel also has a garden with a large terrace and a separate children’s paddling pool. The hotel is 180 kilometres south of Bordeaux and a 30 minute drive from the town of Dax, with its thermal baths. Set by the tree-lined banks of the Luy de Béarn River, the hotel offers a warm welcome in the heart of the village of Amou. Between the Atlantic Ocean and the Pyrenees Mountains, Hotel du Commerce benefits from a privileged location from which to discover the beautiful Landes region. The restaurant serves regional specialities on a lovely terrace in the summertime and by the log fire in the dining room in the winter. The staff can provide useful tips on what to do and what to see in the area and help you make the most of your stay. Mirailh is set in Amou. This property offers access to free WiFi. The holiday home includes 3 bedrooms, 1 bathroom with a hot tub and a bath, a seating area, and a kitchen. A flat-screen TV and DVD player are featured. At Mirailh guests are welcome to take advantage of a hot tub. The accommodation provides a barbecue. Dax is 31 km from Mirailh, while Mont-de-Marsan is 47 km from the property. The nearest airport is Pau Pyrénées Airport, 44 km from the holiday home. Hotel Lodge La Petite Couronne is a small-scale hotel situated in the Chalosse region. The hotel is a wooden 2 floor building in 2,3 hectares park. The rooms at Hotel Lodge La Petite Couronne are large and are equipped with a private terrace or balcony. On site, guests can enjoy a meal at L'Auberge du laurier restaurant. Hotel Lodge La Petite Couronne has a swimming pool with a terrace next to the hotel. The area offers many activities such as a visit to the Chalosse museum and excursions. Gite Tauzia is located in Brassempouy. Guests staying at this holiday home have access to free WiFi. Comprising of 6 bedrooms and 1 bathroom, this holiday home features a TV and DVD player. The holiday home also comes with a well-equipped kitchen with a dishwasher, an oven and a microwave, as well as a a hair dryer. Pau is 47 km from the holiday home. The nearest airport is Pau Pyrénées Airport, 37 km from Gite Tauzia. Set only 3 kilometres south of Hagetmau, this hotel is located by the beautiful Halco Lakes. Enjoy an indoor swimming pool, excellent restaurant and modern rooms designed for ultimate comfort. The Logis Des Lacs D'halco boasts an exciting architectural style. The semi- circular building incorporates wood, stone and glass. The peaceful rooms are fully equipped with modern amenities, including free Wi-Fi internet access. You can sample local cuisine in the hotel’s gourmet restaurant. The dining room lies on the surface of the water to offer a magnificent view on the lake. Free private parking is provided at the Logis Des Lacs D'halco, making it easy to explore Aquitaine by car. House ¨gîte postis is located in Lacrabe. The property features garden views and is 49 km from Pau. The holiday home features a TV. The accommodation is fitted with a kitchen. Dax is 48 km from the holiday home, while Mont-de-Marsan is 34 km away. The nearest airport is Pau Pyrénées Airport, 43 km from the property. Located in the countryside, just 1 km from Gaujacq Castle, Chambres d'Hôtes au Sarrailh offers B&B accommodation, a garden and an outdoor swimming pool with pool house. You can also play table tennis and darts on site. All of the soundproofed rooms have a private entrance, a sofa and a flat-screen TV. Each room features a private bathroom with a shower. A continental breakfast is included and served each morning in the dining room. Traditional dinners with local dishes are also available, upon prior reservation. At Chambres d'Hôtes au Sarrailh, free Wi-Fi is available in the rooms. Free private parking is also possible on site and the Castle of Amou is 7 km from the B&B. Dax TGV Train Station is 30 km from the property. Situated in Peyre, Haou De Campagne provides accommodation with a private pool, free WiFi and private parking. With pool views, this accommodation features a terrace. This holiday home has a kitchen, a flat-screen TV, a seating area and 2 bathrooms with a bath. Speaking German, English and Spanish at the 24-hour front desk, staff are always at hand to help. Guests at the holiday home can enjoy hiking nearby, or make the most of the garden. Pau is 42 km from Haou De Campagne, while Mont-de-Marsan is 41 km away. The nearest airport is Pau Pyrénées Airport, 36 km from the accommodation. House Maison jeanborde offers accommodation in Serreslous-et-Arribans. Pau is 46 km away. The accommodation has a TV. There is also a kitchen, fitted with a dishwasher, microwave and fridge. There is a private bathroom with free toiletries in every unit. Dax is 33 km from House Maison jeanborde. The nearest airport is Pau Pyrénées Airport, 36 km from House Maison jeanborde. Set in Hagetmau, Logis Hôtel La crémaillère features a seasonal outdoor swimming pool, garden and free WiFi. Providing a restaurant, the property also has a bar. Certain rooms at the property include a terrace with pool view. At the hotel, every room has a desk. Each room includes a private bathroom with free toiletries, while some boast garden views. All guest rooms have a wardrobe. A continental breakfast is served every morning at the property. Dax is 42 km from Logis Hôtel La crémaillère, while Mont-de-Marsan is 30 km away. Pau Pyrénées Airport is 49 km from the property. Bed and Breakfast Monségur Preferred hotel ! Chambres d’Hôtes Villa Monsegur is located in Monségur in the Landes department, just 9 km from Hagetmau. It is set within a 2000 m² garden with a heated swimming pool. The guest rooms at Villa Monségur are individually decorated and include a flat-screen TV with cable channels. They feature parquet flooring and a private bathroom with free toiletries and a hairdryer. A continental breakfast with fresh bread, pastries and hot drinks can be enjoyed every morning. Picnic baskets and lunch and evening menus can be prepared upon request, and table tennis can be played on site. Free private parking is available on site and Saint-Sever is 21 km away. 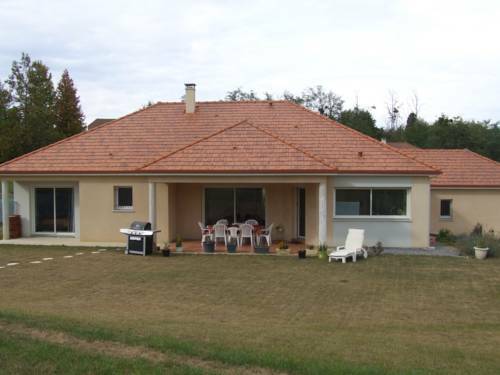 The property is 36 km from Mont-de-Marsan, 45 km from Pau and 32 km from Orthez. Entre mer montagne Béarn et Pays Basque is located in Orthez. Offering free WiFi, the property also has a garden. The villa comes with a TV and a living room. The kitchen is fitted with an oven. The villa offers a terrace. Skiing can be enjoyed nearby. Pau is 46 km from Entre mer montagne Béarn et Pays Basque. Pau Pyrénées Airport is 43 km from the property. Featuring free WiFi and a terrace, Kyriad Orthez offers pet-friendly accommodation in Orthez, 38 km from Pau. A secured parking is available on site. All rooms are equipped with a TV. A buffet breakfast is served every morning. Automatic check-in is available on site. Guests can enjoy the on-site restaurant offering local cuisine and all-you-can-eat buffet meals. Kyriad Orthez is located on the road of Santiago de Compostela. Dax is 35 km from Kyriad Orthez, while Mont-de-Marsan is 50 km from the property. Several beaches in the Landes region are within an hour drive. The nearest airport is Pau Pyrénées Airport, 29 km from Kyriad Orthez. This 3-star hotel is located in Orthez, in the heart of Basque region. With its on-site restaurant, it is just 500 metres from Moncade Castle. Guests can also relax with a drink from the bar. All the rooms at Hotel The Originals Orthez La Reine Jeanne have a satellite TV and a desk. They all include an en suite bathroom with a bath or a shower. Breakfast is served every morning in the communal lounge. The hotel’s restaurant offers traditional cuisine with a modern twist. Other facilities at Hotel The Originals Orthez La Reine Jeanne include a wellness centre with a sauna and a hot tub, available with an additional cost. Meeting facilities and free WiFi are also provided. Hôtel Labat anciennement clinique Labat is an atypical hotel, set in the premises of a former clinic. It is located in Orthez, 5 minutes' drive from the train station. Each room has a TV. All rooms have a shared bathroom with a shower. Hôtel Labat features free WiFi throughout the property. Breakfast is served in the dining room. The property is 35 km from Dax and 50 km from Mont-de-Marsan. The beaches of the Landes region and the Pyrenees are an hour's drive away. Bayonne and Pau are 45 minutes' drive and 30 minutes' drive away respectively from Hôtel Labat. Private parking is free.The nearest airport is Pau Pyrénées Airport, 31 km from Hotel Labat. Offering an indoor swimming pool, a bar and a restaurant, Domitys Les Clefs d'Or offers self-catering, soundproofed accommodation designed for senior citizens. Free Wi-Fi is available in the public areas. The apartments feature free wired internet, a flat-screen TV, a balcony, a kitchen with a microwave, kitchenware, stove and refrigerator, and a bathroom with a shower, hairdryer, slippers and bathrobes. At Domitys Les Clefs d'Or you will also find a garden, a terrace, a shared lounge, a free fitness room and a wellness centre at an extra cost. There is a lift in the building. In the morning, a continental breakfast featuring hot drinks, juices, bread and jam is served in the dining room or in your apartment upon request. The restaurant serves lunch upon reservation. Anglet Airport is located 60 km away and there is free parking on site. Located in the countryside, a 30-minute drive from Pau, Chambres d’Hôtes Domaine de Compostelle offers colourful rooms in a renovated farmhouse. It features free Wi-Fi access and a garden with an outdoor swimming pool. Each room features a view of the surrounding countryside and includes a flat-screen TV and a private bathroom with a bathtub and free toiletries. A continental breakfast with homemade jams is served daily. On request, the hosts also prepare traditional local dishes for other meals. A hot tub and massage treatments are available at an extra charge. Domaine de Compostelle is situated just next to the Way of Saint James, GR65 hiking trail. You can visit Morlanne castle, 2 km away. Situated in Argagnon, Arret et Aller provides accommodation with free WiFi and access to a garden with a terrace. A balcony with garden views is offered in all units. Pau is 39 km from the bed and breakfast. The nearest airport is Pau Pyrénées Airport, 35 km from the property. Located in Tilh, Holiday home Allee Peyris offers accommodation with a private pool. The accommodation is 26 km from Dax. The holiday home comes with 3 bedrooms, a TV and a fully equipped kitchen that provides guests with a dishwasher and a fridge. The holiday home offers an outdoor pool. Orion is 27 km from Holiday home Allee Peyris, while Salies-de-Béarn is 21 km away. Pau Pyrénées Airport is 57 km from the property. Located in a 7000 m² garden, L’Horizon des Landes features free Wi-Fi access in the entire property and a lounge with a library. It is just 25 km from Mont-de-Marsan and Orthez, and 75 km from Pau. All rooms feature a flat-screen TV and tea and coffee maker. Some rooms offer a DVD player. They are complete with en suite bathroom. A continental breakfast is served with homemade products such as bread, yogurt or marmalade. Guests can also sample eggs on request. Upon prior booking, lunches and dinners can be enjoyed at the on-site restaurant. Hagetmau town is a 5-minute drive from the property, allowing easy access to supermarkets, bakeries, olympic swimming pool and sporting activities. The A65 motorway is ideally located 28 km away and free parking is available on site. Set in Orthez, Chez Christiane Et Gerard offers accommodation with a terrace and free WiFi. The bed and breakfast offers a flat-screen TV and a shared bathroom with free toiletries, a hair dryer and shower. Guests at Chez Christiane Et Gerard can enjoy a continental breakfast. Guests can relax in the garden at the property. Pau is 50 km from the accommodation. The nearest airport is Pau Pyrénées Airport, 46 km from the property. Guest accommodation Salles-Mongiscard Preferred hotel ! Maison La Boudigue offers accommodation with barbecue facilities and free WiFi, and is located in Salles-Mongiscard. A continental breakfast can be enjoyed at the property. Guests can enjoy a home-cooked Mediterranean dinner at an extra cost, upon advance reservation. The homestay offers a terrace. If you would like to discover the area, cycling is possible in the surroundings. Dax is 38 km from Maison La Boudigue, while Orion is 19 km from the property. The nearest airport is Pau Pyrénées Airport, 50 km from the property. Holiday home Moulin de Cauhape is set in Piets-Plasence-Moustrou and offers barbecue facilities. Free WiFi is provided. This holiday home comes with a kitchen, a seating area, and a satellite TV. Pau is 40 km from the holiday home, while Mont-de-Marsan is 48 km away. Pau Pyrénées Airport is 34 km from the property. House Labadie is situated in Ossages, 49 km from Bayonne. Dax is 22 km from the property. There is also a kitchen, equipped with a microwave and fridge. Every unit comes with a private bathroom with a shower. Mont-de-Marsan is 48 km from House Labadie, while Hossegor is 46 km away. The nearest airport is Pau Pyrénées Airport, 42 km from House Labadie. This Auberge offers an outdoor pool and air-conditioned rooms with a private balcony and free Wi-Fi. It is located in Berenx, between the Pyrenees Mountains and the Bay of Biscay. Guest rooms at the Logis Auberge du Relais are furnished with a work desk and a flat-screen TV with satellite channels. They each have a private bathroom equipped with a hairdryer. Regional cuisine is served in the Auberge’s restaurant or on the garden terrace, which overlooks the pool and children’s playground. Guests can enjoy a game of billiards in the bar. The Auberge du Relais is situated next to the A64 motorway, and provides free private parking. It is less than an hour’s drive from Biarritz, and local leisure activities include rafting and fishing. House La grange de marsan is situated in Sainte-Colombe. The property features garden views. The holiday home has a TV. The accommodation is fitted with a kitchen with a dishwasher and a microwave. Dax is 49 km from the holiday home, while Mont-de-Marsan is 27 km away. Pau Pyrénées Airport is 49 km from the property. Maison Siosse is located in Malaussanne and offers free bikes and an outdoor swimming pool. Guests benefit from a terrace and a barbecue. With free WiFi, this 1-bedroom holiday home features a cable flat-screen TV and a kitchen with a dishwasher and oven. The holiday home also provides guests with a seating area and 1 bathroom with a shower. Guests at the holiday home can enjoy tennis on site, or fishing in the surroundings. Pau is 38 km from Maison Siosse, while Mont-de-Marsan is 44 km away. The nearest airport is Pau Pyrénées Airport, 32 km from the property. Country House quartier d'Afrique is set in Malaussanne. This holiday home provides accommodation with free WiFi. This holiday home comes with a kitchen, a seating area, and a TV with DVD player. The holiday home offers an outdoor pool. This property features a barbecue. Pau is 37 km from Country House quartier d'Afrique, while Mont-de-Marsan is 46 km away. The nearest airport is Pau Pyrénées Airport, 31 km from the property. La Palomera is located in Berenx, 10 km from the Puyoô Train Station. Guests can relax in the 3,000 square metre garden or by the outdoor swimming pool, when in season. The room at La Palomera is decorated in a classic style and provides views of the Pyrenees Mountains. Guests can enjoy the private terrace and a flat-screen TV. A continental breakfast is served every morning and can be enjoyed on the terrace or in the garden. Guests can enjoy traditional dishes at the Restaurant des Voisins in Salies-de-Béarn. The Salies-de-Béarn thermal baths are just a 10-minute drive away and the Laas Chateau is 15 km away. Free Wi-Fi and free private parking are available. Offering a sun terrace and views of the garden, une chambre chez annick offers accommodation in a private house located in Samadet in the Aquitaine Region, 39 km from Pau. A terrace or patio are featured in certain rooms. All rooms are fitted with a shared bathroom fitted with a bidet and shower. For your comfort, you will find free toiletries and a hairdryer. Une chambre chez annick features free WiFi throughout the property. Breakfast can be served at an extra cost. You will find a shared kitchen at the property. Dax is 46 km from une chambre chez annick, while Mont-de-Marsan is 28 km from the property. Pau Pyrénées Airport is 29 km away. Edenlandes offers rooms in Samadet. All rooms in the guest house are fitted with a TV. Guest rooms feature a seating area. Pau is 45 km from Edenlandes, while Mont-de-Marsan is 33 km away. Pau Pyrénées Airport is 39 km from the property. Domaine De Testelin is a manor house located in the countryside. It offers free Wi-Fi. Rooms are large and comfortabe. All rooms overlook the park. Domestic animals are permitted. The restaurant offers a warm and cosy atmosphere with its old beams and the open fireplace. The chef prepares regional specialties like foie gras, Chalosse beef and fresh seafood. The surrounding area of Chalosse offers many sightseeing acitivities and long walks. The public swimming pool is just 2 km away. Friendly staff at Domaine De Testelin speak French, English, German, Spanish and Dutch. Offering a seasonal outdoor swimming pool, a restaurant and a children’s playground, Chambres d'Hôtes Larrey is located in Audignon, in an 18th-century mansion. There is free Wi-Fi and an 8000 m² park. The bedrooms all have a private bathroom with a massaging shower. They overlook the countryside and the swimming pool. At Chambres d'Hôtes Larrey, guests can find a vegetable garden and some hens. There is also a common lounge with a library and some fitness machines which can be used for free. In the morning, a continental breakfast including homemade jam is available. Regional food can be shared with the hosts in the evenings upon request and the food is served in the dining room featuring a fireplace. Mont-de-Marsan and its train station are 22 km from the B&B and Pau Pyrénées Airport is a 50-minute drive away. Saint Sever is 5 km away and the property offers free parking. Featuring a large garden and private terraces, as well as a sauna and a steam room, Chambres d'Hôtes Les Hauts d'Audignon is a B&B located in Audignon. Free WiFi access is available. Each room has its own terrace with outdoor furniture, and a private bathroom with an Italian shower and a toilet. At Chambres d'Hôtes Les Hauts d'Audignon, a continental breakfast with homemade produce such as jam and brioche is served. Mont-de-Marsan can be found 20 km from the B&B, as well as a golf course and thermal baths. The property offers free parking. Guest House Brameloup Jardin Ovale is set in Coudures and has a seasonal outdoor swimming pool, barbecue facilities and a garden. All rooms boast a kitchen, a flat-screen TV with cable channels, and a private bathroom. The property provides a shared lounge. At the guest house, every room comes with a wardrobe. Free WiFi is available to all guests, while certain rooms are equipped with a patio. The units will provide guests with a microwave. A continental breakfast is served each morning at the property. The restaurant at Guest House Brameloup Jardin Ovale serves French cuisine. The accommodation offers a terrace. A number of activities can be enjoyed on site or in the surroundings, including cycling, fishing and hiking. Mont-de-Marsan is 26 km from Guest House Brameloup Jardin Ovale, while Orion is 47 km away. Pau Pyrénées Airport is 46 km from the property. Offering an outdoor pool, Une Halte en Gascogne is located in Montaut. Free WiFi access is available. There is also an electric kettle. Private bathroom also comes with a hairdryer. Extras include a barbecue, a private pool and an outdoor seating area. At Une Halte en Gascogne you will find a garden, a terrace and a shared kitchen. Other facilities offered at the property include a shared lounge and a games room. An array of activities can be enjoyed on site or in the surroundings, including hiking. The property offers free parking. There is a tennis court nearby accessible with no extra cost. Biarritz - Anglet - Bayonne Airport is 76 km away. The hotel Aux Tauzins is located in Montfort En Chalosse, between Dax and Mont-De-Marsan. The rooms are confortable and have personalized decoration. They are equipped with air-conditioning, flat screen TV and a free Wi-Fi internet access. The restaurant serves gastronomic and regional menus. The hotel Aux Tauzins has a pool, a mini golf and a terrace with a panoramic view. Situated in Coudures in the Aquitaine region, Gite de Charme features accommodation with free WiFi. Some of the units include a satellite flat-screen TV, a fully equipped kitchen with a microwave, and a private bathroom with a shower and a free toiletries. Mont-de-Marsan is 25 km from the holiday home, while Orion is 49 km away. The nearest airport is Pau Pyrénées Airport, 48 km from Gite de Charme. Situated in Puyoô, Chambres chez Vlad offers a terrace. Free WiFi is available throughout the property and on-site parking is provided. Guest rooms in the guest house are equipped with a flat-screen TV. Featuring a private bathroom, rooms at Chambres chez Vlad also provide guests with a garden view. The units include a wardrobe. A continental breakfast is served daily at the property. Bellocq castle is a 10-minute walk from the property. Puyoô train station is a 5-minute walk away. The property is located a 2-minute drive from exit 7 on motorway A64. Bayonne is 45 km from the accommodation. The nearest airport is Pau Pyrénées Airport, 43 km from the property. Gîte Villa Jacaranda is located in Mugron and offers an outdoor swimming pool, a garden and a terrace. Guests are welcome to enjoy the free WiFi. The holiday home is fitted with 2 bedrooms, a kitchen with dishwasher and oven, and 1 bathroom with a shower, free toiletries and a washing machine. A flat-screen TV is featured. Speaking English and French, staff are always on hand to help at the reception. The holiday home offers a children's playground. Dax is 29 km from Gîte Villa Jacaranda. Pau Pyrénées Airport is 66 km away. Featuring free WiFi, an outdoor pool, Jouandous offers accommodation in Habas, 45 km from Bayonne. Free private parking is available on site. Some units have views of the pool or garden. The rooms come with a private bathroom. For your comfort, you will find slippers, free toiletries and a hair dryer. Upon 48-hour in advance booking, guests can share a meal at the owner's table. You will find a shared lounge at the property. Guests can enjoy various activities in the surroundings, including horse riding and cycling. Dax is 19 km from Jouandous, while Mont-de-Marsan is 50 km away. Biarritz - Anglet - Bayonne Airport is 49 km from the property. Bed and Breakfast Bellocq Preferred hotel ! Offering a sun terrace and views of the garden, Chambre d'hôtes Lescarboura is set in Bellocq, 45 km from Bayonne. The double room has a seating area to relax in after a busy day. It has a private bathroom and toilet. Chambre d'hôtes Lescarboura features free WiFi throughout the property. Wine tasting and visits of the castle can be organised in Bellocq. Dax is 25 km from Chambre d'hôtes Lescarboura, while Hossegor is 45 km away. Pau Pyrénées Airport is 42 km from the property. Set in a 2500 m² private garden, Gîte Habas is a one-bedroom cottage with French windows opening onto a terrace and garden with barbecue facilities and outdoor furniture, free Wi-Fi and a fully equipped kitchen. With wooden shutters, the cottage features a bathroom with toilets, a seatting area with a flat-screen TV and radio, and ironing facilities. The bedroom has wooden wardrobes and shelves. The fully equipped kitchen features a refrigerator, freezer, microwave, oven, stove, toaster, electric kettle, coffee machine and kitchenware. A continental or American breakfast can be served on request. Guests have free access to tea, coffee, chocolate and sugar. Gîte Habas offers massages at an extra cost. It is ideal for hiking, cycling and there is a bike shed on site. There is also free private parking at the property and Puyoô Train Station is 8 km away. Guests can discover the city of Dax 22 km away. Situated in Clermont in the Aquitaine region, La Forge De Clermont has a terrace. Featuring free WiFi, the property also has barbecue facilities, a garden and a terrace. This holiday home is fitted with 2 bedrooms, a kitchenette with a dishwasher and a oven, a flat-screen TV, a seating area and a bathroom. The holiday home offers an outdoor pool. Hiking can be enjoyed nearby. A hot tub and a sauna are available upon request and for an extra fee in the property's annex building. Bayonne is 50 km from LA FORGE DE CLERMONT, while Dax is 14 km away. The nearest airport is Pau Pyrénées Airport, 49 km from the property. Below here is the hotels map of Marpaps. Names and details of Marpaps hotels can be shown on the map clicking on the prices icons.